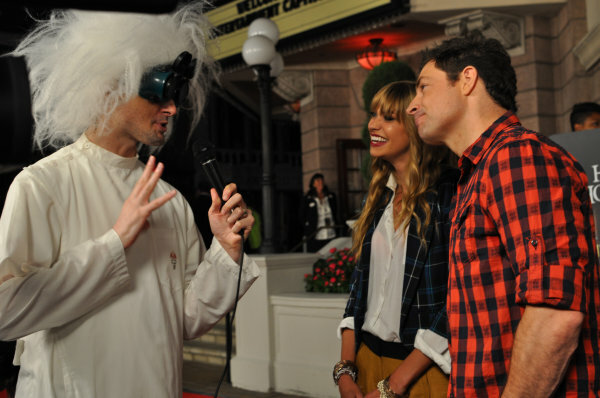 I-Mockery.com | The 2013 Eyegore Awards And Halloween Horror Nights At Universal Studios Hollywood! 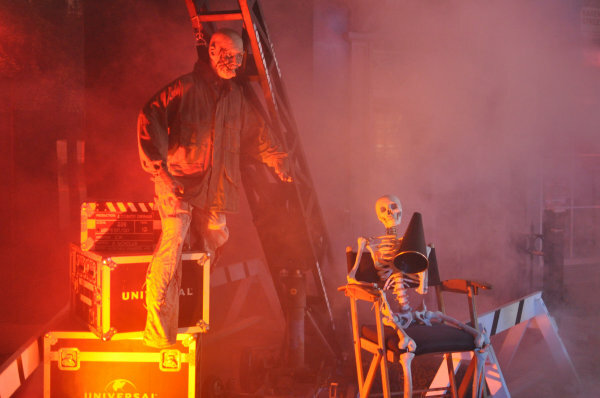 Universal Studios Halloween Horror Nights has returned once again to scare LA residents this Halloween season, and as always, a slew of new mazes have been added to their ever changing haunt. 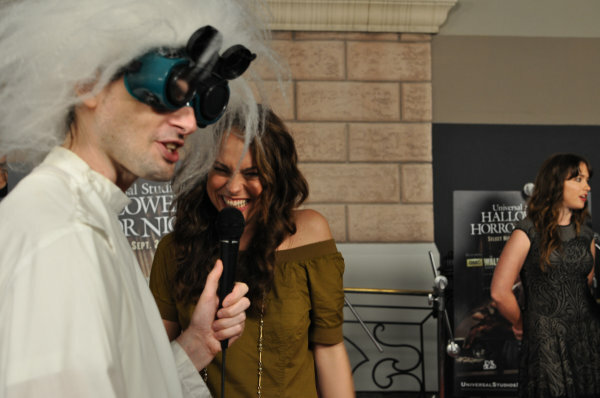 In 2011, they had mazes based on The Thing, Hostel and even one that paid tribute to Alice Cooper. 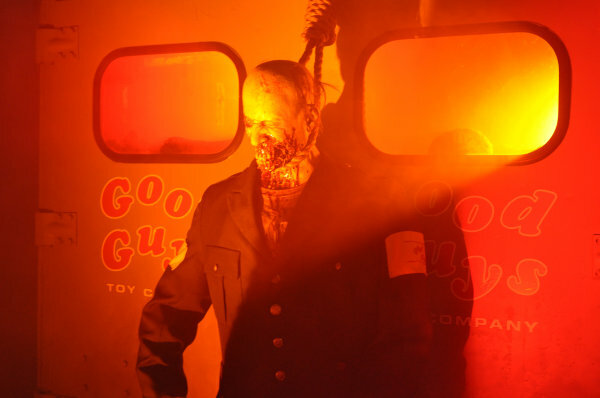 In 2012, they had mazes for Silent Hill and The Texas Chainsaw Massacre. This year, the new maze additions include Evil Dead, Insidious, The Walking Dead, El Cucuy: The Boogeyman, and Black Sabbath: 13-3D. 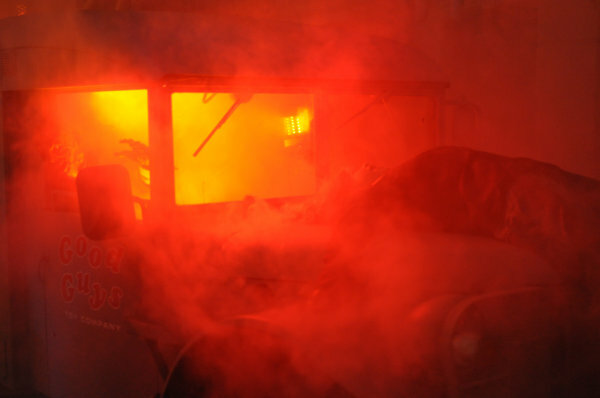 The big tram ride was also based on The Walking Dead, so fans of that show get double the fun. Good times! Alright, now that you're done watching Doc Mock's footage (I still can't believe Bruce Campbell finally showed up this year! ), it's time to take a look at my gallery from the red carpet and then I'll take you on an extensive photographic tour of the all new mazes at Universal's Halloween Horror Nights. 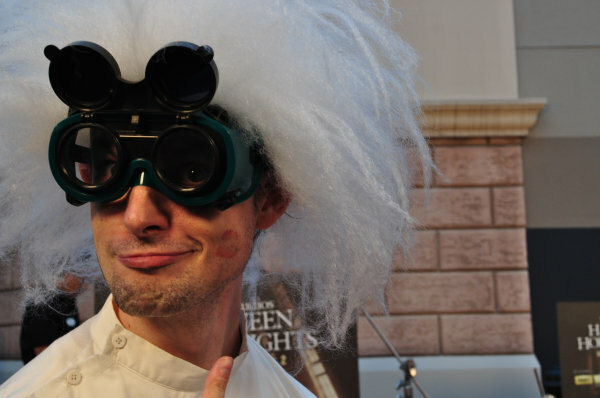 We're talking 200 photos of Halloween madness here. Enjoy! We arrive out in front of the 2013 Eyegore Awards. 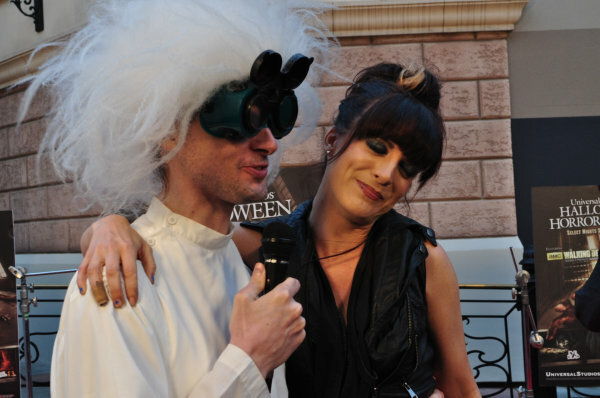 Calico Cooper, daughter of horror-rock icon Alice Cooper, reunites with her old pal, Doc Mock. And she left her mark on his face too. 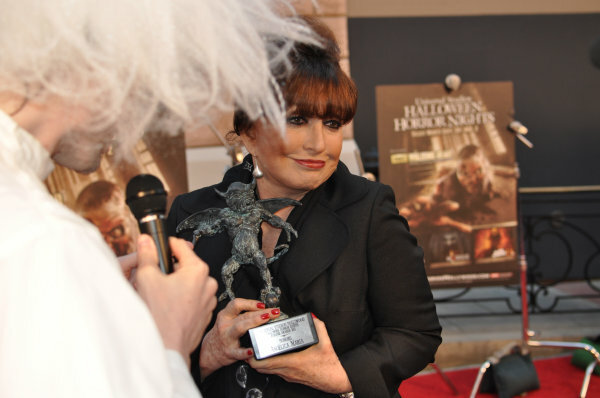 Angelica Maria picks up the Eyegore award she won last year. She was unable to attend then, so she came this year instead. Keen! 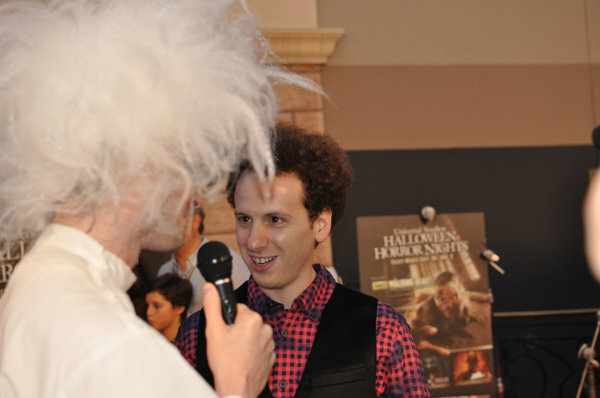 It's Doc Mock's pal, Josh Sussman from Glee, stopping by to compare hair styling tips! 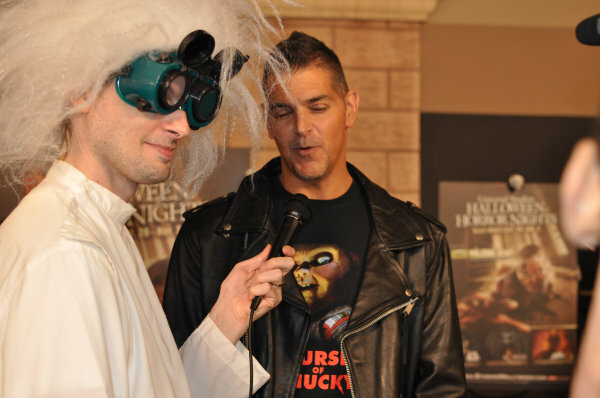 Naturally, Bill Moseley is impressed by Doc's hair too. 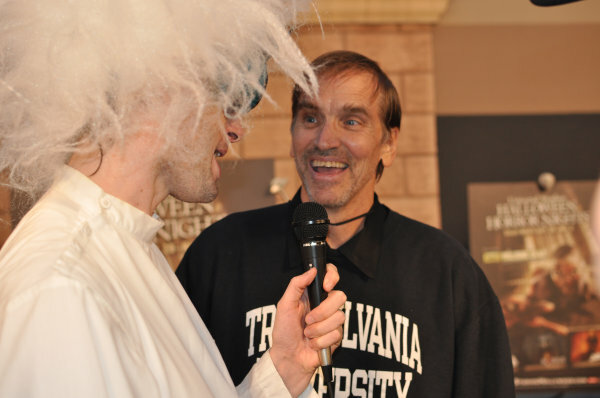 Bill Moseley talks to Doc Mock about how he's fearful of his daughter who is learning Krav Maga. Doc Mock stands alongside Bruce Campbell, Fede Alvarez, and too many mics. 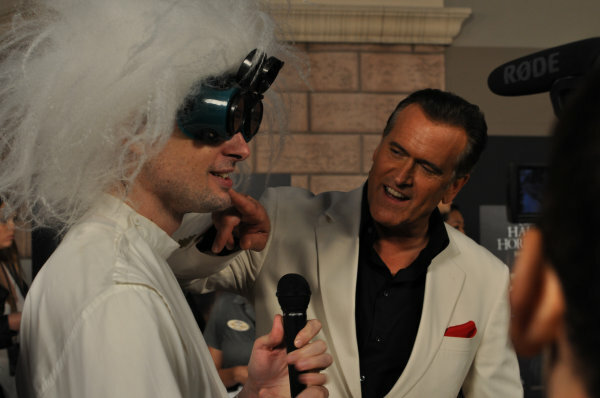 Bruce Campbell admires the lipstick on Doc's cheek and hopes he gets a kiss from Calico as well. Lin Shaye was happy to hang with Doc Mock. 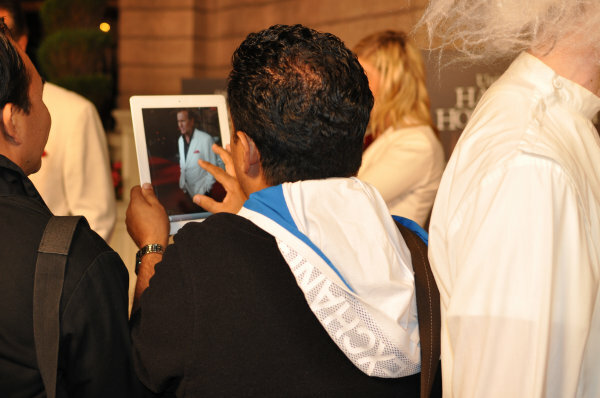 Press members using iPads to take photos. Surely a sign of the apocalypse. 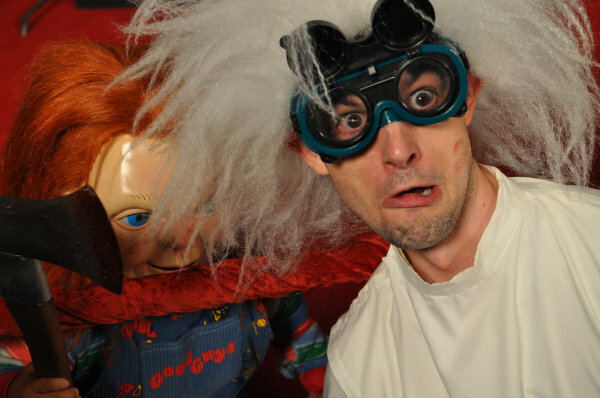 Doc has a nice time chatting with two of Chucky's newest victims: Maitland McConnell and Brennan Elliott. 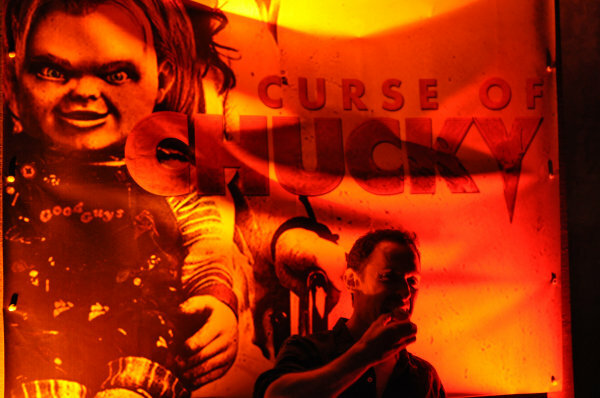 And here's the heroine who will be going to battle against Chucky in a wheelchair in Curse of Chucky, Fiona Dourif. And she also happens to be the daughter of Brad Dourif, the voice of Chucky! Keen! And yes, she scares easily. And here's the man behind the Child's Play films, Don Mancini! 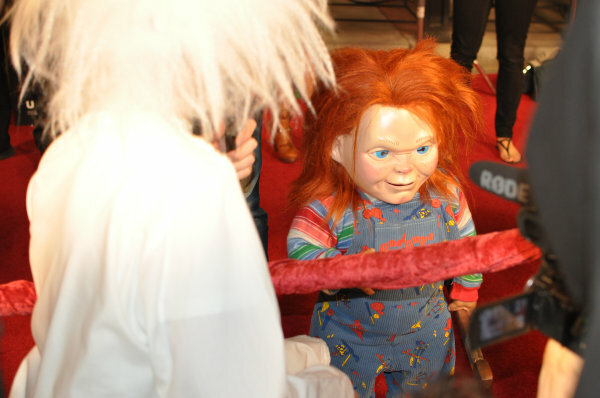 So nice of Chucky to show up and say hi... without trying to murder anybody. I guess he really is one of the Good Guys! 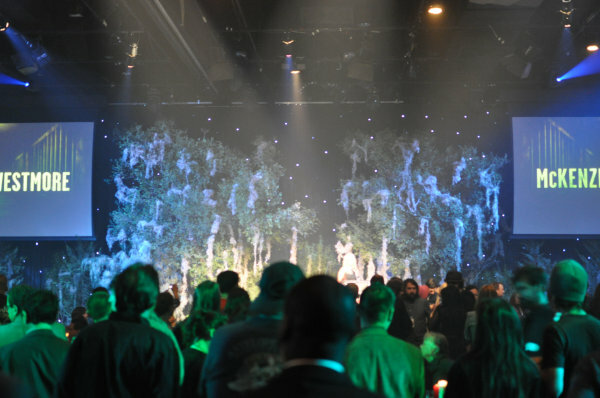 Everybody then heads inside as McKenzie Westmore hosts the Eyegore Awards with a creepy tree backdrop. 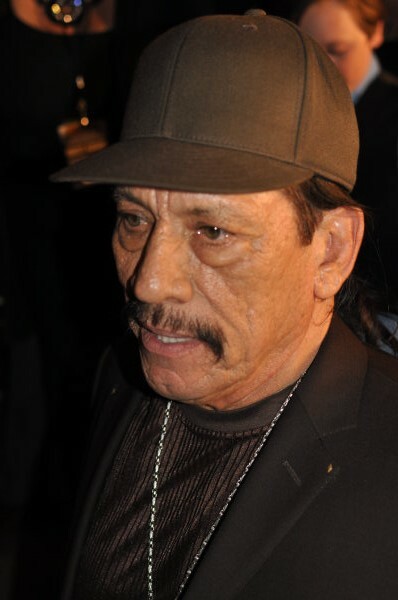 Danny Trejo shows up to experience his own maze - El Cucuy: The Boogeyman! 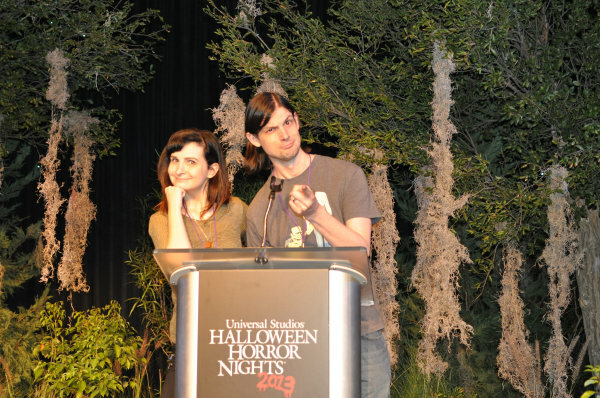 Should Re and I host the Eyegore Awards next year? Clearly. Hmm... 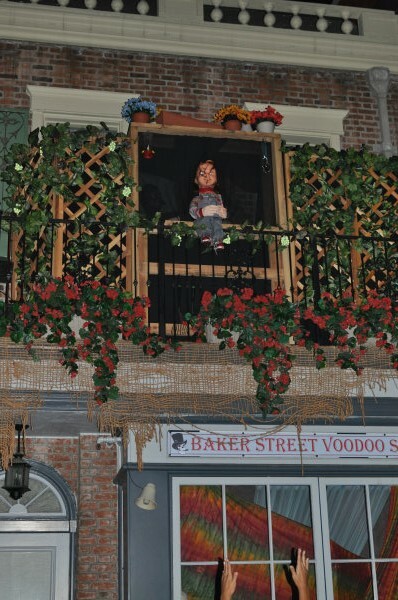 I'm sure that's a good omen to kick off Halloween Horror Nights. Our pal Brian isn't going to let the fear of Chucky prevent him from eating cupcakes. used a vicious verbal onslaught to harass anybody who dared to walk by. 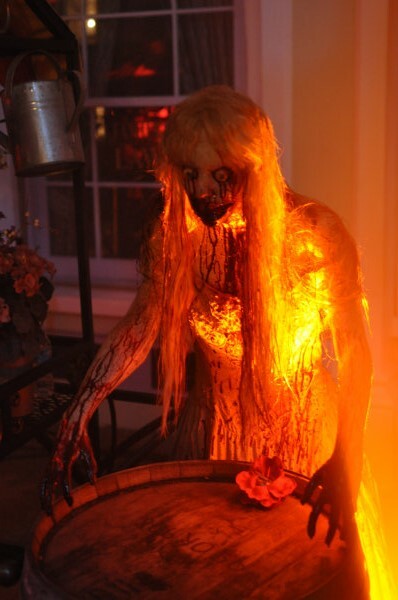 She really likes her barrel. I think I'll let her keep it. This Good Guys truck might have some electrical issues. Writing your movie in blood on an ice cream truck? Now that's guerilla marketing! How nice! They wanted me to join their cult club! None of them realized Chucky was sneaking up from behind until it was too late. 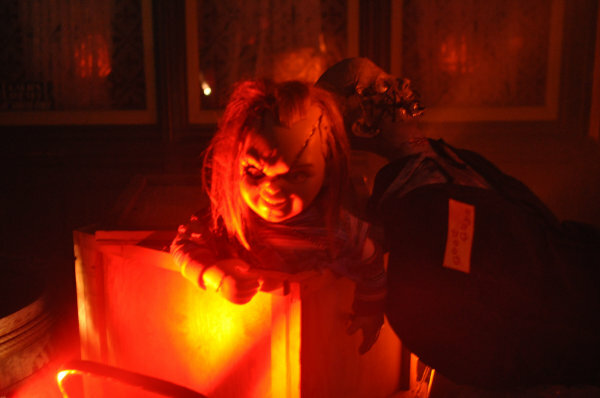 Either Chucky made them all explode, or my camera couldn't handle the insanely bright light: You make the call! Wanna work in Hollywood? It just might kill ya. 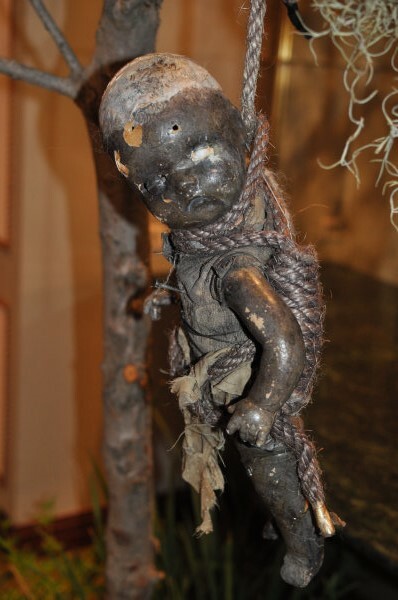 Now let's head into our first maze of the night: El Cucuy: The Boogeyman! These are always a treat. Thanks! Thanks for another great photo tour, Rog! 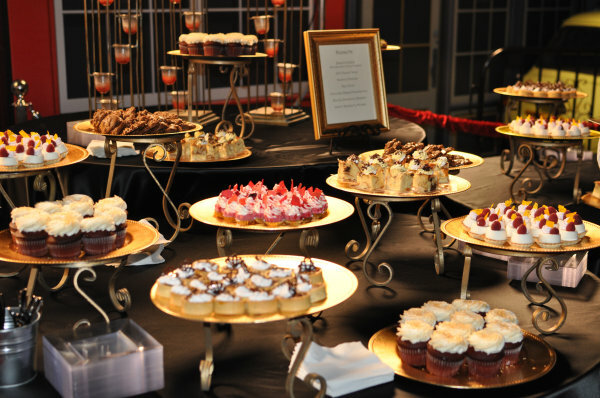 I can never make it to these events, so seeing your review is the next best thing! Thanks for the pics and article. I always look forward to these on an annual basis. Thanks! I called the pizza dude! Excellent article, RoG! Good stuff, sir. Can't wait to go in a few weeks! Dude...Awesome trip as always -RoG- Thanks 4 taking us all with you through Hell & Back! I love love love these! 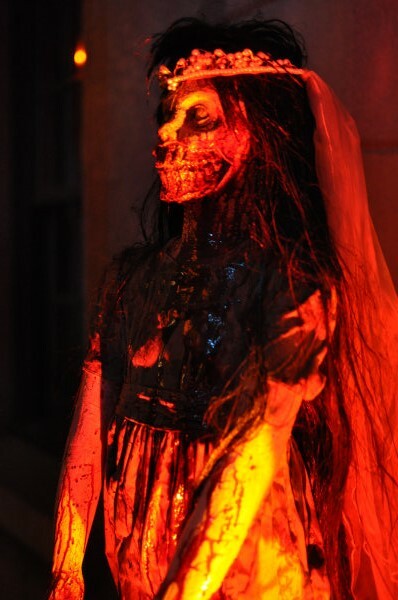 I hope one day you guys will go to Knott's Scary Farm when Elvira is there. This year it looks like she's got an entire shop of souvenirs that make me extremely jealous to be on the East Coast. 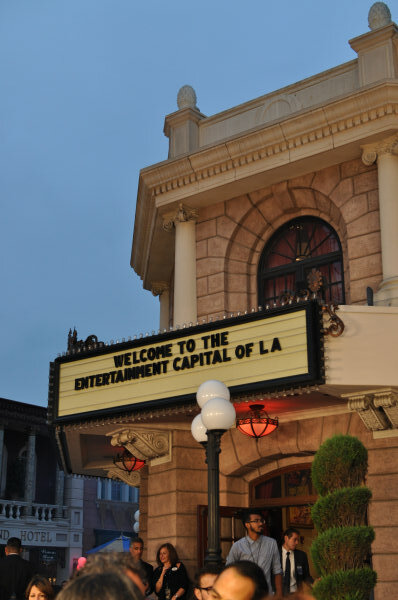 goblyn - Yeah, if I can make it to Knotts before the end of the month, I'll definitely check out the Elvira show. I was really glad to hear she's finally returned after all these years. Glad you all enjoyed the photos and the Doc Mock video! 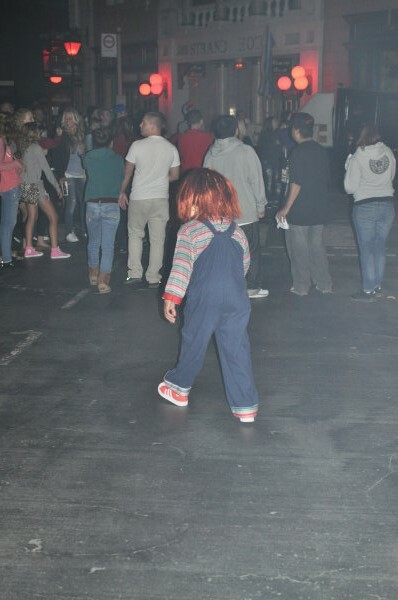 I went to Horror Nights on Saturday, and man, I never realized how tough it must be to get some of these pictures. You're seriously quick on the draw, RoG. Black Sabbath was my favorite maze because of all the crazy visuals (and that giant gas mask dude) but El Cucuy was a really nice surprise too. I'd love to see more of that. 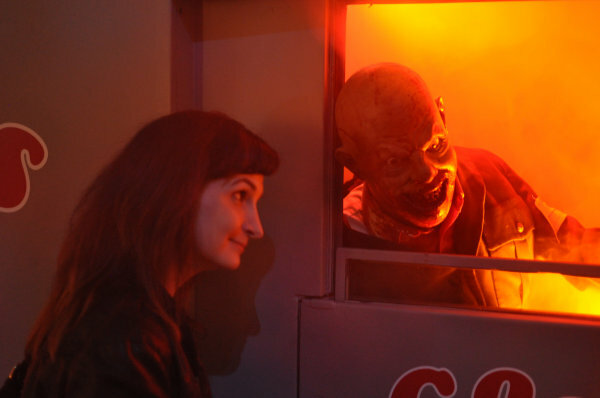 I have to say, though, Insidious was the only maze I didn't enjoy. 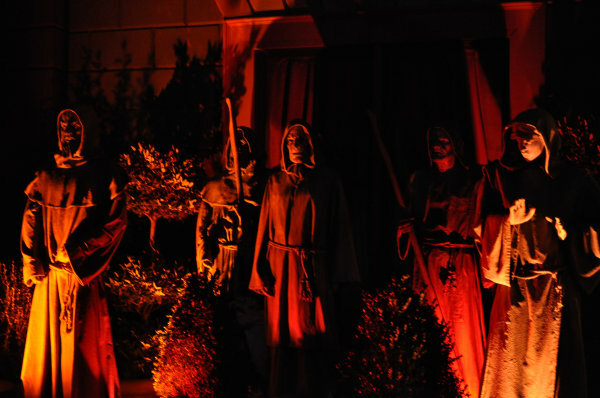 The rooms were cramped, there were props and actors everywhere, and the constant bright flashes and loud sounds made the whole thing more overwhelming than fun. Yeah, It's extremely difficult to get decent haunt maze photos, and that's why you really don't see a lot of sites doing it. I'll often actually stand off to the side in the mazes while people walk by, as I try to get the photos, sometimes snapping 10 or more to get just the right one!